PPRHI Providence Property Restoration Home Inspections Inc. was incorporated as an S-corp back in 2006, but the history leading up to that goes back further. Whats in a name!! Providence. My business will sink or swim by the graciousness of my Lord Jesus Christ. It is his will to be implemented each and every day. Property. Residential property is our area of expertise. Restoration. I love history, and historic homes and buildings. They have much to teach us about our past, structure, life, and a by gone era when craftsmanship mattered. What I’ve gleaned from restoration of historic properties has taught me all I know about the proper way a home should live, breath, and work. Home Inspections is self explanatory its just something we do. My name is Dave Tursi. I’m the owner of this outfit. My experience goes back to 1996 when my wife and I bought our first home. A 1938 brick bungalow in the heart of the Plaza-Midwood Historic District in Charlotte NC. We acquired the property for virtually a song because we were poor, and couldn’t afford anything nicer. Needless to say it needed a good bit of work. From knocking out walls, to skylights, landscaping, to master bed and bathrooms, and to just about everything in between. My current project is renovating from top to bottom a 3400 sqft. 100 year old victorian about 2 blocks from down town Rock Hill South Carolina in beautiful York county SC. I’m painstakingly renovating this home. I made lots of mistakes over the years, and yet I learned the ins and outs of how a home should perform on a daily basis. I’ve been buying, renovating, and selling residential property for fourteen years now. Do I have a lot to learn, with out a doubt. With the craziness in the current Real Estate Market, the buying, renovating, and selling end of my business has been slow of late. Thats why at the beginning of the year I added Home Inspection to my tool-belt. 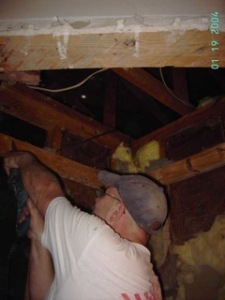 There are those who would say I’m not qualified or experienced enough because I’m not licensed in NC as well, But what I’d say to them is that the experience I’ve gained in procuring my own properties for re-sale and my experience over the last 14 years with renovation has prepared me for my tenure as a home inspector. I’d certainly look in every nook and cranny of every system in a home for myself, and it is my pledge to do the same for my clients.